Launched earlier this year, the Gifto cryptocurrency wallet has reached one million wallet holders and is accumulating transactions at a tremendous speed. The Gifto wallet was first integrated with the popular live streaming app, Uplive, owned by parent company Asia Innovations Group (AIG). Uplive is a mobile social entertainment app which allows live streamers to monetise their content through the transactions of fun virtual gifts sent to them by their audiences. These transactions can happen both via Gifto cryptocurrency tokens (GTO) and normal fiat currency. AIG followed the success of virtual gifting with the release of Giftomon, the world's biggest blockchain-based game. Players of Giftomon can use GTO to purchase unique game characters and items, thus contributing considerably to the transactions on the Gifto wallet. Across the two platforms and other apps, Gifto has reached half a million transactions. 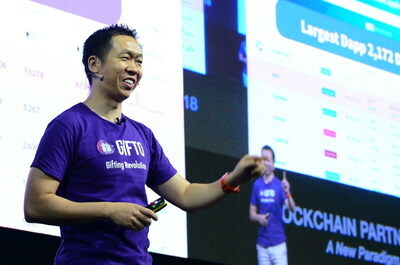 CEO and Founder of Gifto and Asia Innovations Group, Andy Tian, comments: "These are exciting times for Gifto as we drive the mass adoption of blockchain across social entertainment. We have already reached half a million wallet transactions, and are projected to hit one million transactions before the end of the year. Gifto is one of the few blockchain projects that has a real business model other than the value of coin rising. We are also looking to expand the usage of our token with decentralised apps for gaming, charity and commerce." Gifto is the first cryptocurrency token integrated into a mobile social entertainment app. Uplive generated $100 million in revenue last year via virtual gifts and $250 million is projected by the end of 2018, clearly demonstrating the potential of blockchain technology across entertainment applications. With one million wallet holders, Gifto is the world's largest blockchain-based dapps ecosystem to date. Built upon the successful virtual gifting model within the Uplive live-streaming app, Gifto is a platform agnostic monetisation solution for content creators and bloggers on YouTube, Instagram and Facebook. Giftomon is the world's biggest blockchain-based game. The game is developed using HTML5, allowing users to play on nearly any device. Since its release in July, Giftomon's number of daily active users has already exceeded 4,000 - this is twice the amount of the next largest competitor. Giftomon's selling points include engaging gameplay and the ability to use Giftomon to mine the Gifto token (GTO).